Black Friday DSLR deals are everywhere. Although we are not past the big day, we have still have plenty of Black Friday camera deals and Cyber Monday camera deals dropping – and there are more are on the way. If you are on a bit of a budget and fancy a camera that's will guide you into the world of DSLRs, then this one is for you. You get a nice $100 off and for this, you get a camera and VR lens setup. Yes, this is a budget DSLR but it's a great one and we haven't seen it given a discount such as this. This is another brilliant camera/lens deal. The Nikon D3500 + AF-P DX NIKKOR 18-55mm VR +AF-P DX 70-300mm f/4.5-6.3G ED Len is the perfect starter pack for anyone starting who wants to take their photography that little bit more seriously. With a saving of $350, this is a great deal. Save $570 - If you're looking for an enthusiast-level DSLR, the Nikon D7500 is a great shout. Boasting a 20.9MP sensor and EXPEED 5 image processing engine, the camera comes with a 16-80mm lens, as well as a free shoulder bag and memory card. Bargain. So what other DSLR discounts do we expect to see this year? To make some predictions, it's helpful to take a look back at some of the top bargains from last year, as we predict what – and where – we expect to see the best Black Friday DSLR deals this year. Back in 2017, we saw some great savings on Nikon and Canon DSLRs over Black Friday. Although the best-value bargains came in the form of Black Friday mirrorless camera deals, we still saw a selection of quality DSLR discounts from major retailers – particularly Amazon, eBay, Walmart, Jessops and B&H Photo – across both Nikon and Canon's portfolios of DSLRs. And following the big announcements at Photokina in September, we anticipate some cracking Black Friday DSLR deals on superseded stock this year. For anyone serious about photography, a DSLR is widely seen as the most obvious choice. Mirrorless cameras offer an intriguing alternative, with some notable advantages too – phase-detect AF, optical viewfinders, better battery life, a wider range of lens systems and ‘silent' shutters, to name but a few – but for many photographers, the DSLR is still best. Read more: DSLR vs mirrorless cameras: How do they compare? DSLRs offer big sensors and great image quality, together with the convenience of interchangeable lenses. We're talking about a vast choice of telephotos, primes, wide-angles, macros and other specialised optics for practically any kind of photography. They also have optical viewfinders, which many people prefer to the electronic counterparts in mirrorless cameras. To offer the optical viewfinder, DSLRs use a mirror inside the body which flips up out of the way at the moment of exposure. This makes the cameras larger and more mechanically complicated than mirrorless cameras. On the upside, you don't just get a clear optical viewfinder, you get much better battery life, too. A typical mirrorless camera might get 300-400 shots on a single charge, whereas DSLRs can get 600-1000 – and often more. Entry-level DSLRs also give you just a little bit more for your money. Remember, all DSLRs have viewfinders, even the cheapest, but you have to pay a premium to get a mirrorless camera with an electronic viewfinder built in. You can buy DSLRs with or without lenses (the latter known as a 'body-only' option) and sometimes the lens bundles will vary from one dealer to another. In our list below we've picked what we think are the most likely combinations, but there may be others – and if you think you've found a better camera/lens deal than ours, go for it! If you're upgrading from a camera phone or a compact camera, this is a great place to start. DSLRs designed for beginners are easy to use, thanks to fully automatic modes and handy on-screen help. And, when you're ready to take your photography to the next stage, they have all the manual controls you need to start making your own decisions. Canon's cheapest entry-level DSLR is pretty basic, but it's simple to operate and has all the manual controls that beginners will need if they want to progress and learn more about photography. You can get it even cheaper with an 18-55mm 'DC' lens, but this lacks an Image Stabilizer; we'd always recommend the better EF-S 18-55mm f/3.5-5.6 IS II image-stabilised kit lens. The Nikon D3400 is aimed squarely at novices with few external controls but, like the EOS 1300D, you can take over with manual controls when you're ready. The D3400 is more expensive than the 1300D, but it comes with a top-class 24MP sensor and a great retracting AF-P DX NIKKOR 18-55mm f/3.5-5.6G VR kit lens that keeps the overall size down for packing away and travelling. Canon's downsized EOS 200D is smaller than a regular DSLR, and yet it still supports the same lenses and comes with lots of great features, including Canon's latest 24MP Dual Pixel CMOS AF sensor, and a fully articulating touchscreen display. It's more expensive than the EOS 1300D but it's a much better camera. The Sony A68 is something of an outsider but it could be tempting at the right price. It looks like a DSLR, but it actually uses Sony's fixed-mirror SLT design and an electronic viewfinder, the combination of which allows for faster autofocus in live view than most regular DSLRs. It's a well specified camera, but Sony's SLT range has not seen much love in recent years, so it may be nearing the end of the line. Nikon's D5600 is a useful step up from the entry-level D3400, with a fully articulating rear screen, better controls and more advanced photographic features. Both the camera and Nikon's AF-P lenses are so small and light it's the next best thing to a mirrorless camera for size. Even the pre-Black Friday prices are tempting, so this is definitely one to watch. The main differences between the EOS 800D and the cheaper EOS 200D are its slightly larger body, slightly faster continuous shooting speed and much more advanced autofocus system. Both cameras use Canon's Dual Pixel CMOS AF system for fast live view autofocus, but for regular viewfinder shooting the EOS 800D has a better autofocus system. These cameras are the perfect upgrade when you've outgrown your first DSLR and you're ready for something a with a bit more power and versatility. Our top tip? Work out what our current camera doesn't have that you wish it did – like more external controls and dials, faster continuous shooting or 4K video – and keep that firmly in mind when you buy. The EOS 77D is like the EOS 800D's older brother. 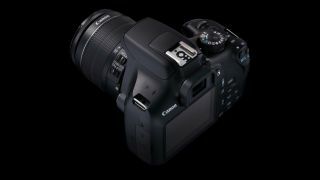 Technically, the two cameras are almost identical, but with two control dials instead of one and a status panel added to the top plate, the EOS 77D has much more appeal to enthusiasts. In fact, with much the same technology as the next camera up in the range, the EOS 80D, the fact that it's priced as keenly as is it makes it a great value choice. The Nikon D7200 has held its value well and remains a powerful, solid and versatile camera for enthusiasts. Nikon has a newer 20MP sensor in the D7500 and D500, but these cameras' advantages are mainly in speed and high-ISO performance, as well as 4K video. As newer models they are less likely to be discounted too. This is Canon's do-it-all enthusiast-level workhorse, with a great 24MP Dual Pixel CMOS AF sensor, a vari-angle LCD screen and 7fps continuous shooting. It's still a great buy but it's somewhat under siege by the newer, smaller and cheaper EOS 77D, as well as the EOS 7D Mark II, which is a real powerhouse and beats the EOS 80D for any kind of serious sports/action photography. What you're paying for with the EOS 7D Mark II is speed and power for action photography. It uses a slightly lower resolution 20MP sensor than Canon's other APS-C DSLRs, but it delivers a stunning 10fps continuous shooting speed and has a sophisticated 65-point wide-area autofocus system too. It's Canon's equivalent of Nikon's powerful D500. In a canny bit of range-filling, Nikon has introduced the D7500 halfway between the affordable D7200 and the powerful D500. You get 8fps continuous shooting, 4K video, a maximum ISO of 164,000 and a tilting touch-screen display. If your budget stretches to this then opt for it instead of the D7200, but if you need all the speed and durability you can get, the D500 is the one to go for. We've lumped the D500 in with the enthusiast section because it has an APS-C-sized sensor, but really this is a professional camera that could easily be used alongside a full-frame DSLR. It offers a rugged build, 10fps continuous shooting, 4K video and a 153-point AF system, and the smaller sensor is an advantage for wildlife and sports photographers as it gives their telephoto lenses extra reach. This is the ultimate choice for advanced amateurs and professionals. A full-frame camera gives you a step up in quality from a regular APS-C model, and opens up a whole new world of professional and speciality lenses. It's not quite Nikon's cheapest full frame DSLR because the older D610 is still on sale, but the D750 is a more modern, more versatile camera, not least because it has a tilting rear screen. Its 24.3MP resolution isn't going to grab any headlines by today's standards, but it does allow the D750 to deliver great all-round image quality for the price, especially at higher ISOs. Resolution isn't everything, after all. The EOS 6D Mark II is the replacement for the original EOS 6D. It's designed as a low-cost entry into full-frame Canon DSLR photography, but while the Mark II is a much better camera than the original, it's also much more expensive. The original EOS 6D is pretty basic but it's a fine camera with a good chance of being discounted on Black Friday – our advice is to look out for both of these cameras on the big day. The DSLR market is largely a two-horse race between Canon and Nikon, but Pentax has also always been in the running as an outsider. The K-1 is a very interesting camera, with a 36.3MP full-frame sensor, a tough and cleverly articulating rear screen and a sensor-shift mechanism used for image stabilisation. You also get a Pixel Shift Resolution mode for high-resolution still, together with an Astrotracer mode, anti-aliasing filter simulation and plenty more. Inevitably, the announcement of the D850 has put the D810 in the shade. Nevertheless, the D810 is still on sale, and if the newer model drives prices down that's great news for bargain-hunters. The D810's all-round image quality has become legendary, and it's backed up by one of the two best lens systems in the world. Sony keeps saying it hasn't given up on its DSLR-style translucent mirror cameras, and the A99 II is proof. Its killer feature is its ability to capture 42.4MP images at an astonishing 12 frames per second, backed up by an advanced hybrid phase- and contrast-detect autofocus system. Sony does seem to be putting most of its effort into its E-mount cameras these days, so the A99 II and Alpha lens system may no longer be a priority – but this is the perfect upgrade for existing A-mount users. Canon's professional workhorse can do a bit of everything very effectively. Its 30.4MP sensor has enough resolution for all but the most demanding commercial work; it can shoot action at 7fps with the help of its 61-point autofocus system; and it shoots 4K video too (albeit with a big crop factor). For Canon users, it's the obvious do-it-all camera, but for those who are undecided, the newer Nikon D850 trumps it in just about every respect.